Newly manufactured in the United States by CCI, this ammunition is great for target shooting, plinking, or range training. 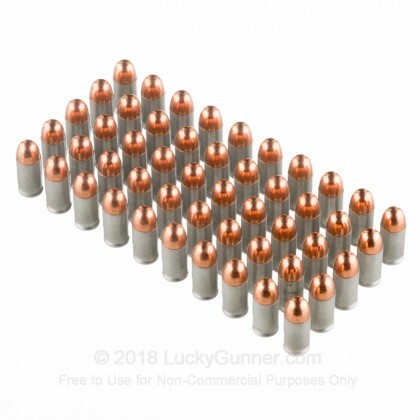 Each round sports a full metal jacket bullet atop a boxer-primed aluminum casing. This product is non-corrosive and non-reloadable. excellent product. Performed flawlessly in my sons practice pistol. Good price. Extremely fast shipping. Will order more soon! haven't been able to get to range but feel confident your products are perfect for my needs your staff is great! timely accurate and efficient. wouldn't buy from any one else! thank you for your great service ken. Exceptional range ammo that is reasonably priced. Fast and easy way to get brand name ammo without driving all over town and hoping to find some. Best place to buy what I need. 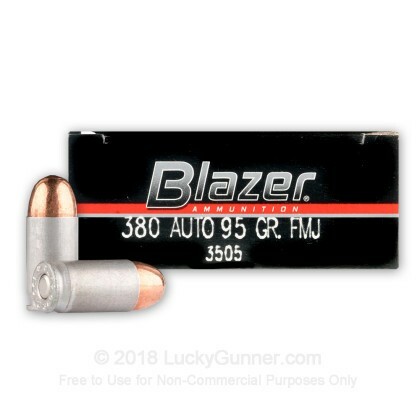 380Auto-95 gr FMJ- blazer is a fine product...No miss fires or jams....Only place to get it for me is at Lucky Gunner. Love their fast service, prices could always be lower....but hay I'm just an Old Man that likes to shoot. Performed well in my Glock 42. Almost impossible to find 380 ammo in CT. Glad they had the product. Will most certainly do business with Lucky Gunner again. Great product and price. Excellent service. I will use them again. I've had trouble finding 380 Auto ammo. Thank you for having what I needed and no one else did good job. i have used this type of cased ammo in other guns. works well reliable and case won't corrode. Feeds reliably, shoots without difficulty. As accurate as I was. No malfunctions. 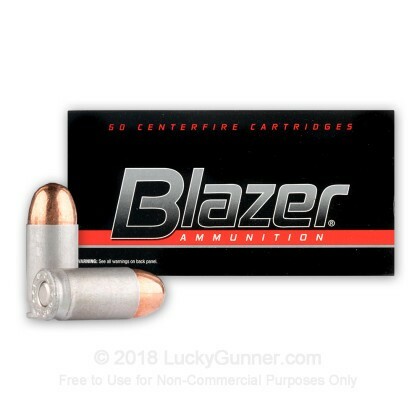 Blazer is good ammo, the price is a little high, considering it can't be reloaded. 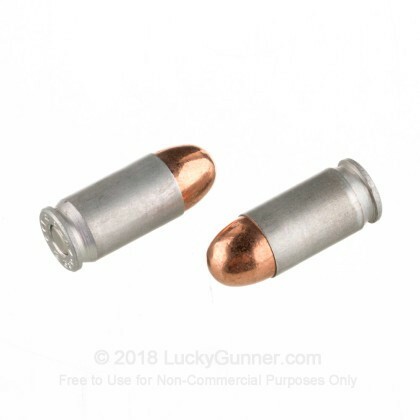 Overall good performing ammo, delivered quickly by Lucky Gunner. Have now purchased a number orders. This transaction was as good as the rest. Used at gun range with my ladies shooting league, groups were as tight as my shooting skills allows. Some better than others but that is the shooter NOT this ammo. It preformed excellently, hit exactly where I aimed. All groups were right on and not a worry with jamming or misfire's. After 450 rnds I'm pleased. It may not have the take down power of others but it also don't have the price of the others. OK, so it's not Cor-Bon or some other over priced ammo. It's still damn good stuff for what you pay for it. great place to buy ammo,got my order in a timely matter..
Great but only because there wasn't anything else available. Funny what you'll buy when you literally CAN'T find any other ammo for your .380. No issues with the website or service, and no problems with my .380 Bersa eating the stuff, but you can't reload or recycle Aluminum so I won't be buying this again unless I'm desperate. Other than that, LuckyGunner Rules! Very good value and service. 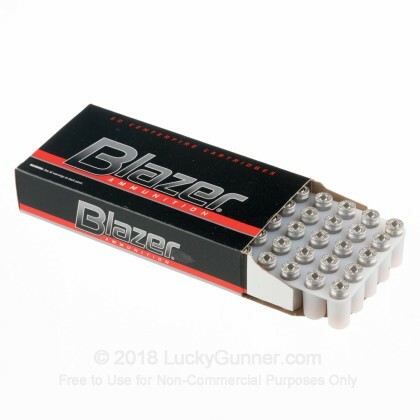 I'm not a big fan of Blazer aluminum cased ammo but I bought this to be used with several other brands for breaking in a new Sig P238. I experienced no malfunctions with this ammo during the break in. In this case you don't get what you pay for!! Most often, you get what you pay for. 380 is hard to find - this would not be my first choice but it served it purpose. Average value from a GREAT DEALER. Great product. Quick shipping. Great price. I am happy and will buy here again. 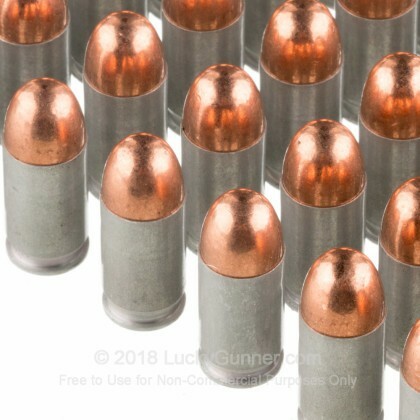 Excellent type of rounds for .380 ammo. I liked the way these rounds shot out of my .380 they were smooth and my groups were good. OK for the wife to learn to shoot! Thanks, Fast shipping, no problems so far. Wife has fired about 20 rounds in her LCP. not bad for what your getting! took the wife to the range to try her new gun. gor this ammo for her to just test her gun. Not one problem. Will buy again. Great service for Luckugunner! !Will be buying from them again. Very, Very dirty burning ammo - you're in for one helluva cleaning job when you get home from the range. Please click here for our current in stock specials on .380 Auto (ACP)! We also have this 380 Auto - 95 Grain FMJ - Blazer - 1000 Rounds ammo in stock in a bigger quantity.